Bonnyrigg Rose made it a happy return for manager Robbie Horn as they won 3-1 to dump Lowland League side BSC Glasgow out of the SFA South Region Challenge Cup. Horn, whose spell at Berwick Rangers ended last month, is back in the hotseat at New Dundas Park having enjoyed great success between 2015 and 2017. Rose travelled to Alloa’s Indodrill Stadium to take on the side fourth in the Lowland League and took the lead on 20 minutes when Keiran McGachie scored the simplest goal he will ever score. A shot was deflected towards the BSC goalkeeper and, when the spin took it out of his grasp, McGachie rolled the ball into the empty net. Five minutes later, Dean Hoskins headed home the second. BSC came more into the game in the second half and pulled a goal back from Declan Hughes only for Ewan Moyes go straight up the park and head home a decisive third goal for Rose. Hoskins, who didn’t finish the game because of a foot injury, was delighted to bag a crucial goal. He said: “It was important because if we had taken a single goal in at the break they would have taken a lot from that. Penicuik, with new manager Kevin Milne in charge, beat Peebles 5-0 with doubles from Sam Jones and Arron Ponton, and a strike from Calum Connolly. 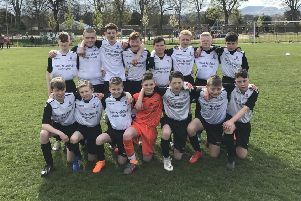 Linlithgow’s up-and-down season continued with a heavy 5-1 defeat at the hands of East Stirlingshire, Darren Smith getting what turned out to be a consolation goal for Mark Bradley’s side. Musselburgh were beaten 3-1 at Hill of Beath while Edinburgh University lost 4-0 at Sauchie. Lothian Thistle Hutchison Vale beat Cumbernauld Colts 2-1 while Preston Athletic lost 5-0 at East Kilbride. Broxburn were on East of Scotland League business at Heriot-Watt won 7-0 thanks to a hat-trick from Zander Miller and further goals from Ross Nimmo, Conor Kelly, Nicky Locke and new signing Cameron Ross.